When was the last time you made Monkey Bread? Oh it's sooooo easy and sooooo fun to make and soooooo yummy!!!! We had it for breakfast this morning and my girls (who are 10 and 6) cut the biscuits, rolled them in sugar and cinnamon, and placed them in the greased bundt pan. I melted the butter and brown sugar and poured it over the top then popped them in the oven. Super easy!! WARNING: The wait for these to bake seems like EONS when you start smelling the cinnamon from the oven!!!!!!!!!! Heat oven to 350 degrees. Greased bundt pan. In a gallon size plastic zip bag, put in white sugar and cinnamon and mix. Open biscuit cans (this always scares me when they pop!!!) and cut each biscuit in 4 pieces. Place all the cut pieces in the zip bag and toss to coat all the pieces with sugar and cinnamon then carefully put the pieces in the bundt pan. On the stove, melt butter and stir in brown sugar. Bring to a boil and stir well. Pour over the top of the biscuits in the bundt pan. Put bundt pan in the oven and bake at 350 degrees for 30-35 minutes. When done baking, take out of oven and let stand for 10 minutes before turning out of pan. Turn out onto a plate and then pick off the pieces you want to eat- like little monkeys picking at their food!! FUN!!!!! This is a fun recipe to make with children. Let them use butter knives or even plastic knives to cut the biscuits!! Let them toss the cut biscuits with the sugar/cinnamon mix!!! Will it get messy? LOL Probably. But will they have a wonderful time and laugh and make memories? OH YES!!!!!! So, what are you waiting for?????? Go make some Monkey Bread and make some memories!!! Yum! Have you ever made it in muffin tins? Just as yummy, but the bake time is much faster. I haven't made these before,they look so good. Great tip Wendi..I will have to give it a try!! GREAT tip, Wendi!!!! I'd LOVE it that way- all the crispy edges!! My 6 year old loves the gooey center the best. Good thing it makes a lot!!! Oh, wow! This looks amazing. My two aunts make this bread together. They always act silly and have so much fun while making it. This brought back a lot of memories. So thankful for your visit and kind words on my blog today. God bless you! 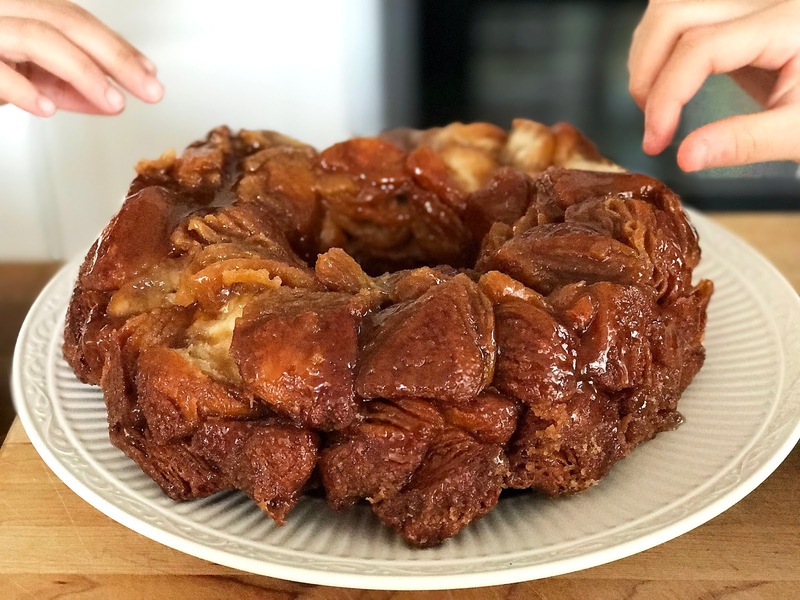 Your Monkey Bread looks amazing! Hope you are having a great week and thanks so much for sharing with Full Plate Thursday. We love monkey balls in our home. Such a fun treat for everyone to share.